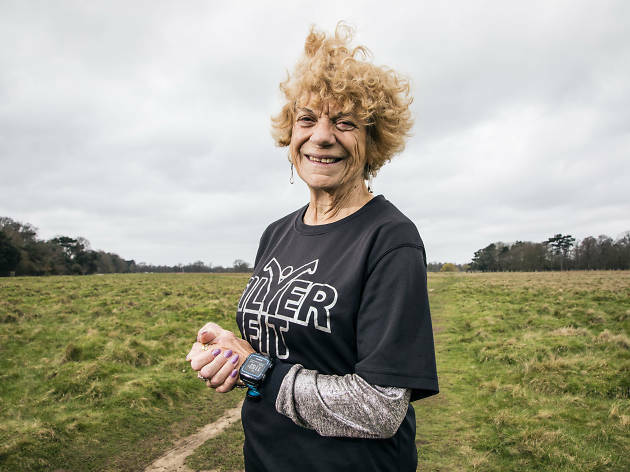 ‘When I was 50, I went to watch a friend run the Nottingham Marathon, and that’s what initially tempted me to start running. I told my husband I was contemplating a half-marathon in three months’ time and he said, ‘You couldn’t even run three miles.’ Yes I can, I thought. This woman can! I started training the next day. I already played a bit of netball and squash, but that was all, because I was working full-time and had three kids. I had done a bit of running at school in Edgware, but I wasn’t good at it. Nottingham was my first half-marathon, and with 12 weeks’ preparation, I did it in two hours and 15 minutes – then did it another two or three times. I joined a running club, and in 1996 the club secured a London Marathon place and gave it to me. I couldn’t let them down, especially as they’d been so incredibly supportive when my husband died. He had cancer, which came so quickly. I’ve now done the London Marathon five times. It’s the best in the world: the support is great all the way round and the route is so impressive. After all that running I’d injured my knees, so I began swimming and cycling more. I started with the Crystal Palace Triathlon in 2001 and worked my way up to an Ironman Triathlon in Lanzarote at the age of 74. Ironman involves walking, jogging or running a full marathon after a 3.8-kilometre swim and a 180-kilometre bike ride. It’s hard work: it takes about 20 hours a week to train for, and I’m not a very good swimmer! I’ve also competed in duathlons, which is run-bike-run. In my first competition in 2003, I was the only person in the 60-65 age group. That meant I qualified to go to the world championships later that year as a member of the GB team, where I ended up getting a gold medal. I repeated that in Australia the following year and then in Italy, where I only beat one of the other female competitors in my age group – a German lady – because she lost count of how many laps she’d done! I got the gold medal and fortunately she took it well. But very often I’ve been the only competitor in my age group. As my kids say, all I’ve done is be the oldest and come last. 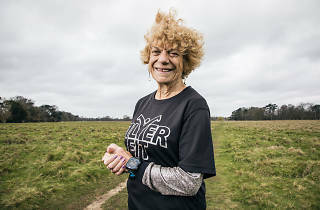 I now run a charity called Silverfit, which leads fitness sessions for older people in eight London boroughs. In some areas it’s free and in others the maximum price is £3, so that no one can’t afford to come. We do Nordic walking, pilates, silver cheerleading, t’ai chi and more. It’s never too late to start exercising – just make sure you’re having fun, and then you’ll keep being active. Some of our 80-year-old participants managed to finish The Big Half with walking poles earlier this year. ‘Irongran: How Keeping Fit Taught Me that Growing Older Needn’t Mean Slowing Down’ by Edwina Brocklesby is published by Little, Brown.